Oaks are usually divided into two groups: red-black oak group and white oak group. Some problems of oaks are restricted to or are more severe in one group versus the other. It is therefore important to know to which group an oak belongs. Leaf shape is the simplest way of telling one from the other. 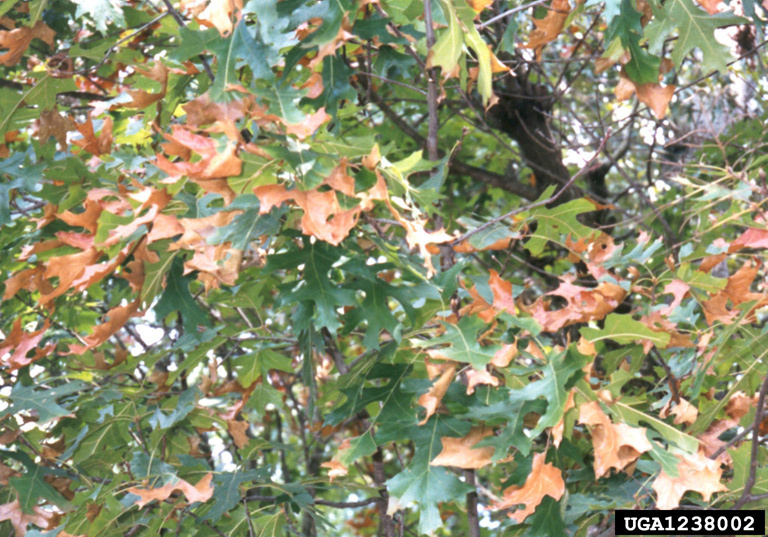 Red-black oak group (top image): Leaves have pointed lobes (when present) with a bristle at the tip of each leaf and each lobe. Examples: blackjack oak, laurel oak, pin oak, scarlet oak, shingle oak, Shumard oak, water oak, and willow oak. 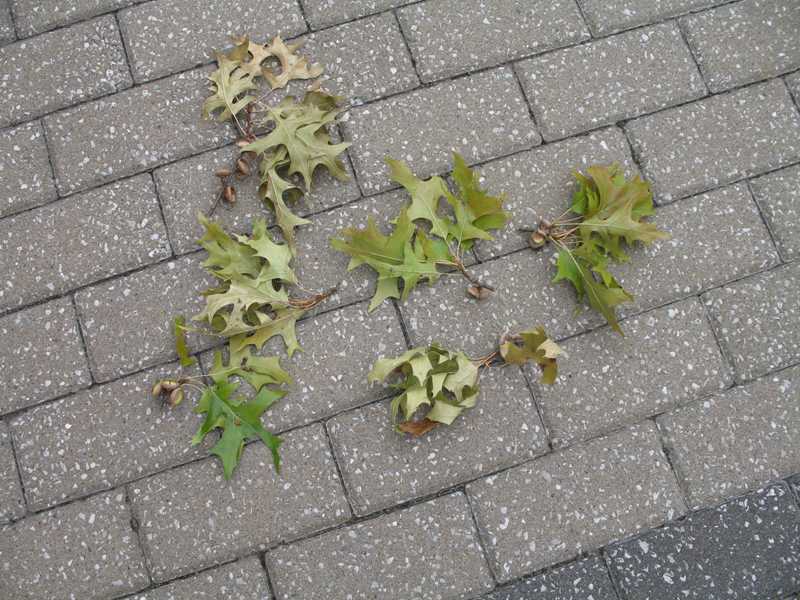 White oak group (bottom image): Leaves have rounded lobes (when present) and lack a bristle at the tips of both leaves and lobes. Examples: post oak, bur oak, chestnut oak, chinkapin oak,swamp chestnut oak, overcup oak and live oak. This fungal disease infects and kills cambial tissue, causing the death of the trunk near the ground and the major roots. Above-ground symptoms are undersized, discolored and prematurely dropping leaves. Branches begin dying near the top of the tree, and clusters of honey colored mushrooms form at the base of the tree. 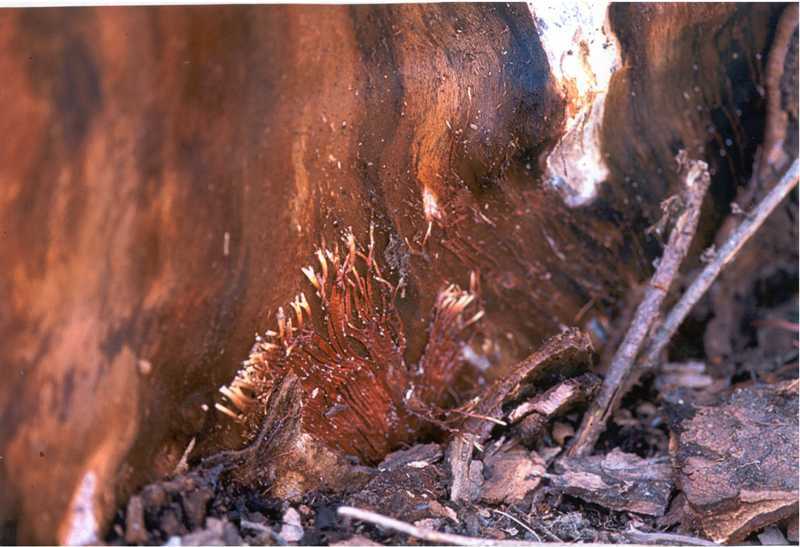 A fan-shaped mat of fungal strands may also be found beneath the bark at the base. 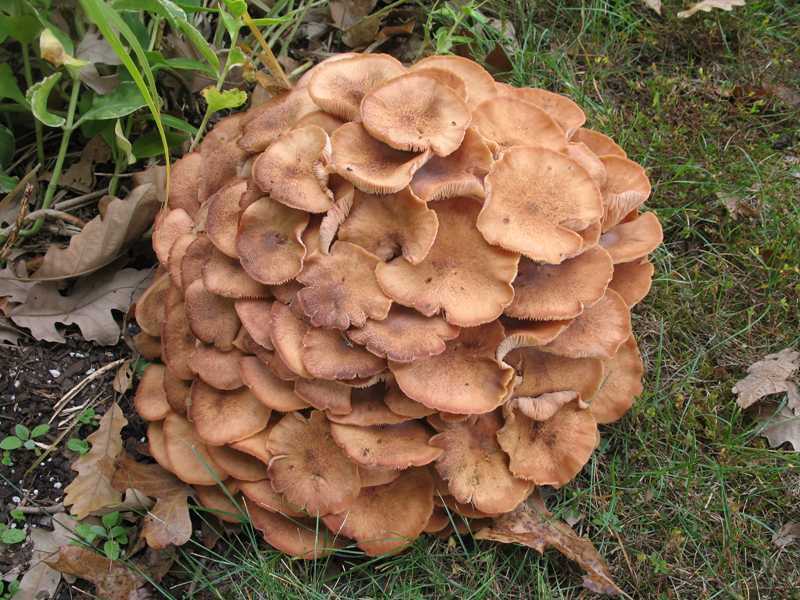 This fungus is very aggressive and will affect many woody plants. 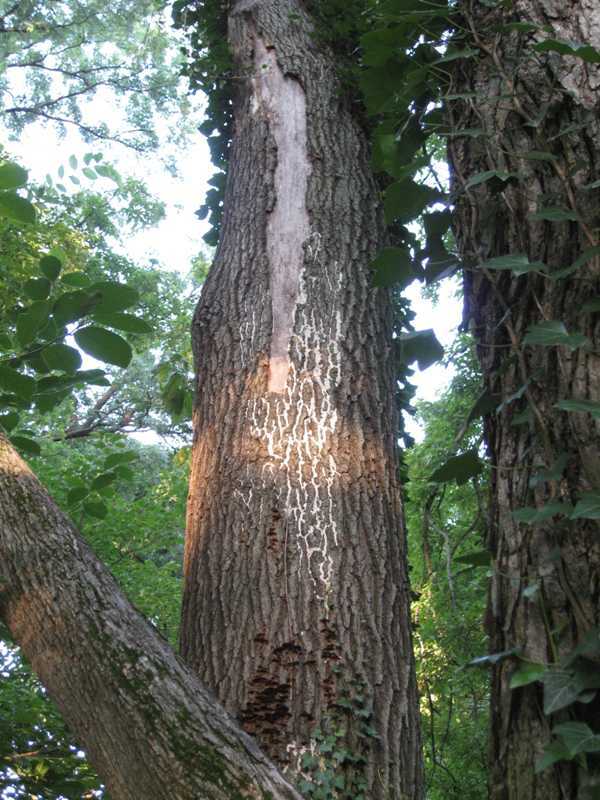 This fungal canker attacks weakened trees through wounds and grows in the sapwood. The red-black oak group is more susceptible than the white oak group. Infected branches die back. Dead sunken patches of bark slough off exposing a silvery layer of fungus. Trees may die in 1 to 2 years. Look-alikes: Until silvery fungal mat appears, all problems causing dieback could be confused with this disease. This disease, Phytophthora ramorum, has NOT been found in the Midwest. It has been reported in California and Oregon. Laboratory tests must be done to confirm this fungus. It has many hosts and care must be taken in moving these hosts from place to place. 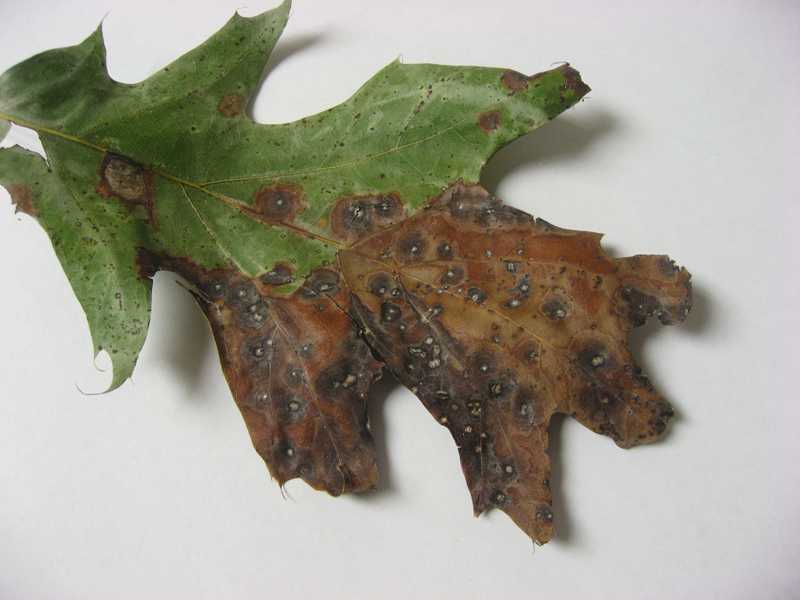 Red oaks and pin oaks are very susceptible to this fungus. 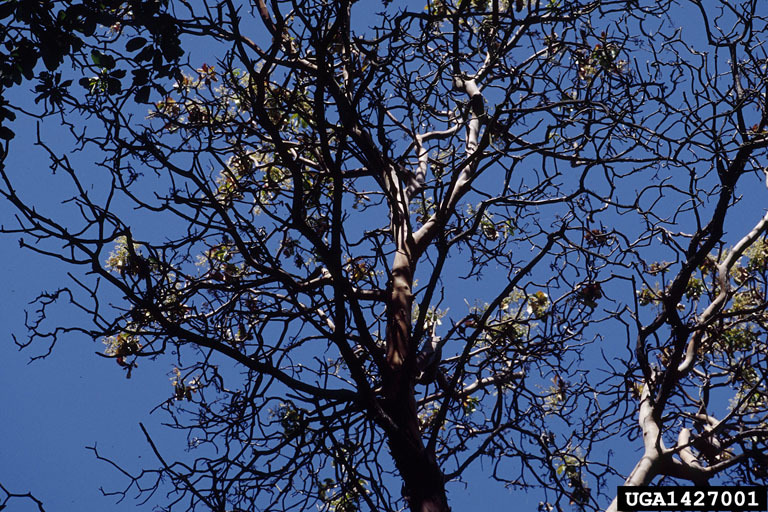 Look-alikes: All problems causing dieback could be confused with this disease. Oaks in both groups are the main hosts of this beetle. 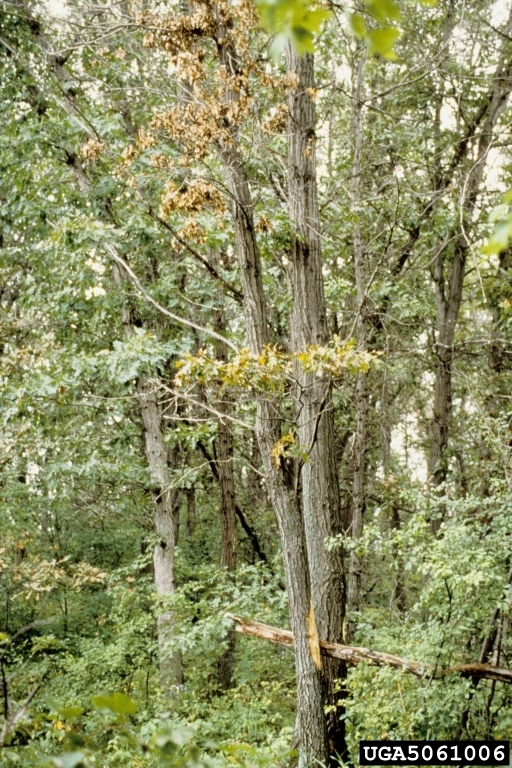 The symptom of a borer attack is wilted foliage on scattered branches during late summer. The leaves turn brown but remain on the tree for several weeks to a month before dropping. 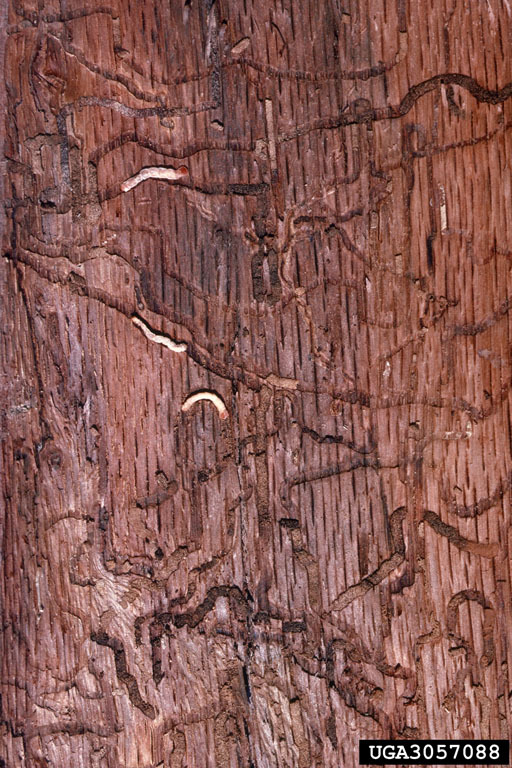 The larvae tunnel beneath the bark, and their galleries are evident when bark is removed. 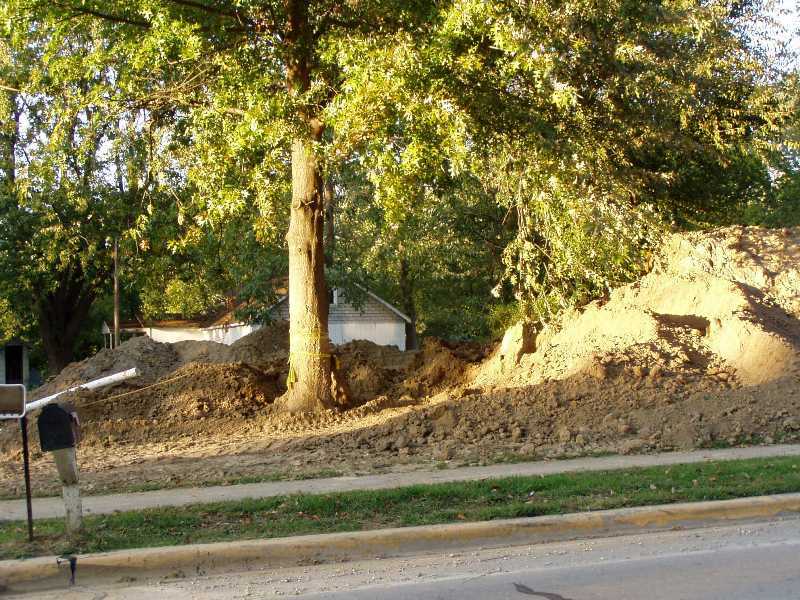 Trees die 2-3 years after infestation. Look-alikes: All problems causing dieback and all borer infestations could be confused with this problem. Systemic, usually lethal disease. 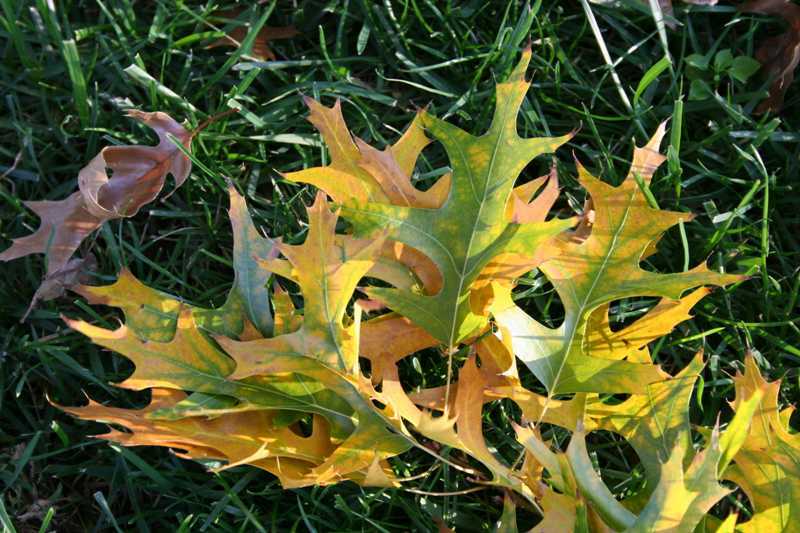 The red-black oak group is more susceptible than the white oak group. Disease spread is by root grafts, insects and occasionally squirrels. Leaves develop chlorotic (yellow) veins that eventually turn necrotic (brown and dead). Defoliation may be rapid. The tree canopy becomes thin and no new leaves emerge. Symptoms appear in spring or summer. Peeled bark or a cut branch from an infected tree may show a brown or black discoloration in the outer annual sapwood ring. 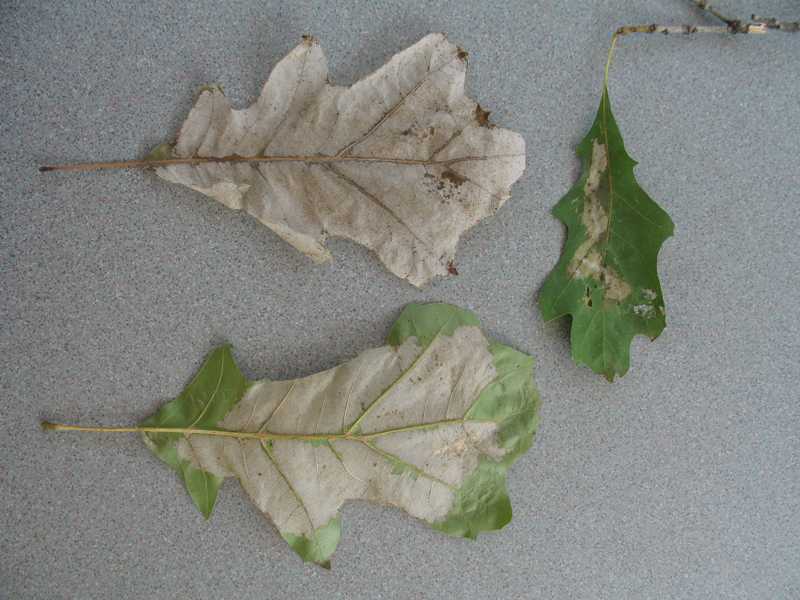 Look-alikes: Bacterial leaf scorch, tubakia leaf spot, and all problems causing dieback. Slowly progressing but usually lethal disease that affects oaks in both groups. Chlorosis and faded green color develops at leaf tips and margins then fades to drab green and turns brown. Symptoms appear in late summer, first in outer, upper part of the crown and involving all leaves on a shoot. 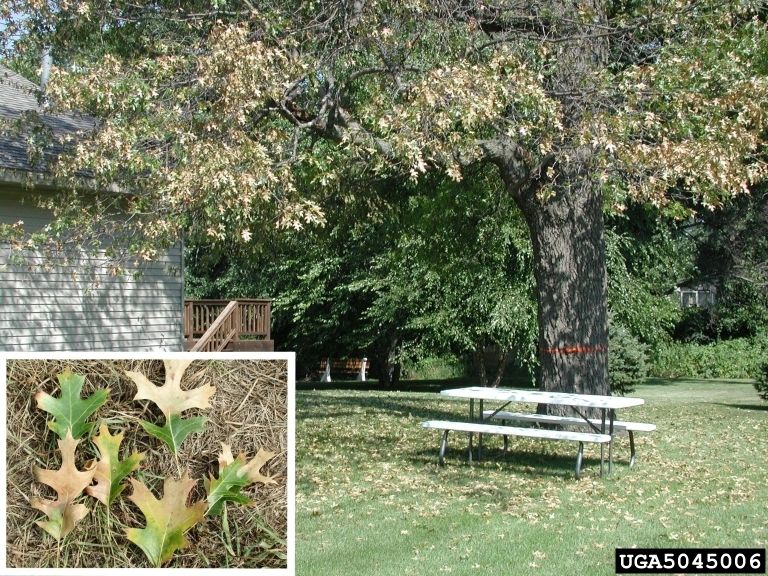 Symptoms of scorch usually show up on one or two branches and spread each year. Leaves are retained until autumn. There are no dark streaks in the sapwood. Affects both oak groups. Brown, dead areas appear along leaf veins. Lower branch leaves are most affected. Affected leaves appear to be sun scorched. The fungus needs cool wet weather. Rarely a serious problem. 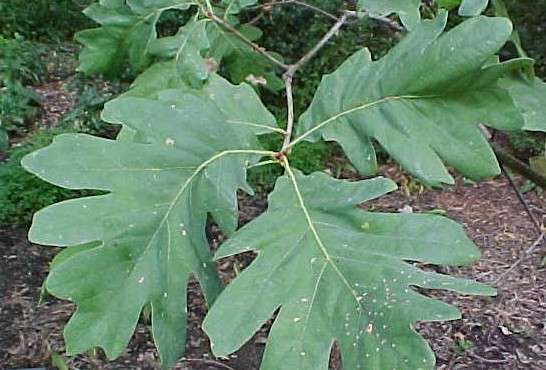 Brown leaves appear on trees in the white oak group in late spring. Severe infections may cause the leaves to turn black, curl up and fall. On the underside are brown galls with the larva of a small wasp inside. On the ground, the movement of the larva inside the gall causes the gall to jump a few centimeters. 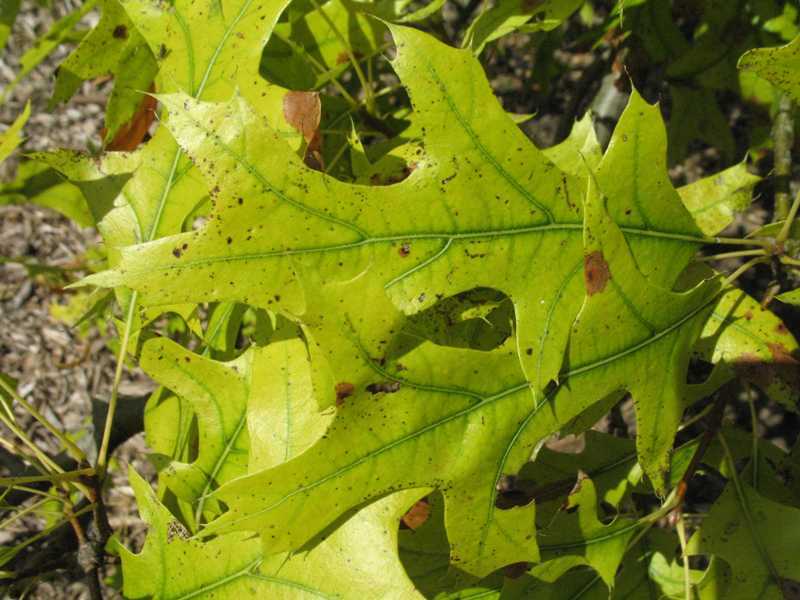 Trees may be defoliated, but the problem is very rarely fatal for healthy oaks. This is a cyclical problem. This fungal disease usually occurs in late summer or early fall. Symptoms are round to irregular, red-brown spots on leaves surrounded by light brown areas. The areas may merge to kill large areas of the leaf. 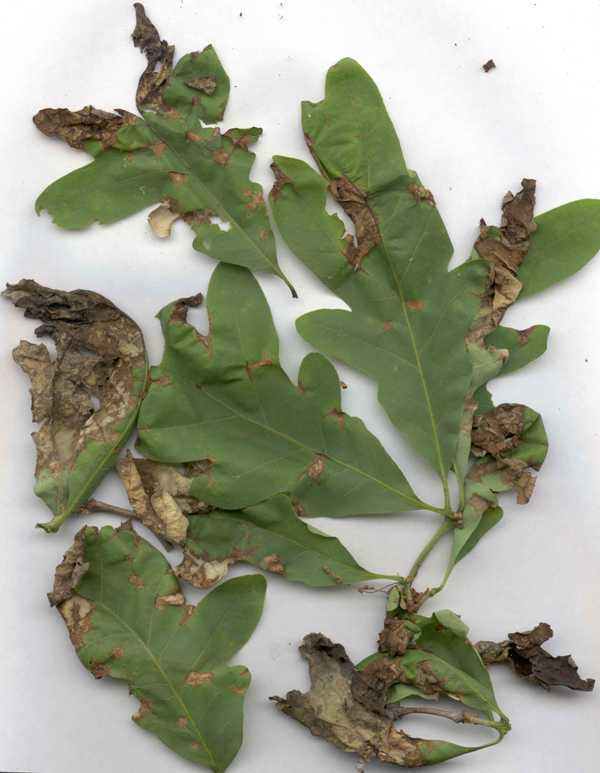 This disease may cause major loss of foliage on both oak groups, although it is not usually considered a serious problem. 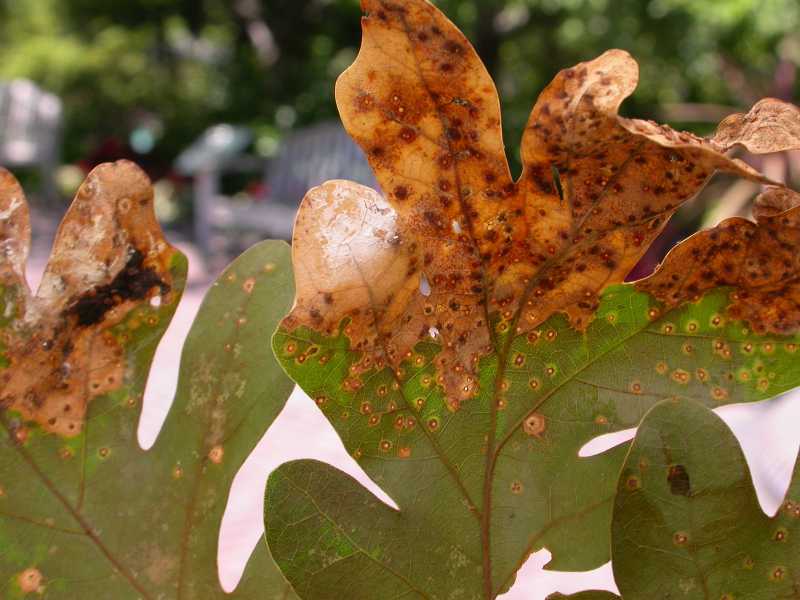 This fungal disease affects both oak groups, but especially the red-black oak group. Blister-like raised areas appear on the upper leaf surface while the underside is sunken. The leaf shape may be distorted. Infection may occur if the weather is cool and rainy during leaf emergence. Rarely a serious problem. This fungus occurs on both oak groups. Symptoms include a whitish powdery growth mainly on the underside of the leaves that is later sprinkled with black peppery looking fruiting bodies. It is mostly found along the veins and midribs of the leaves in late fall. The leaves may be distorted in shape. Seldom a serious problem. 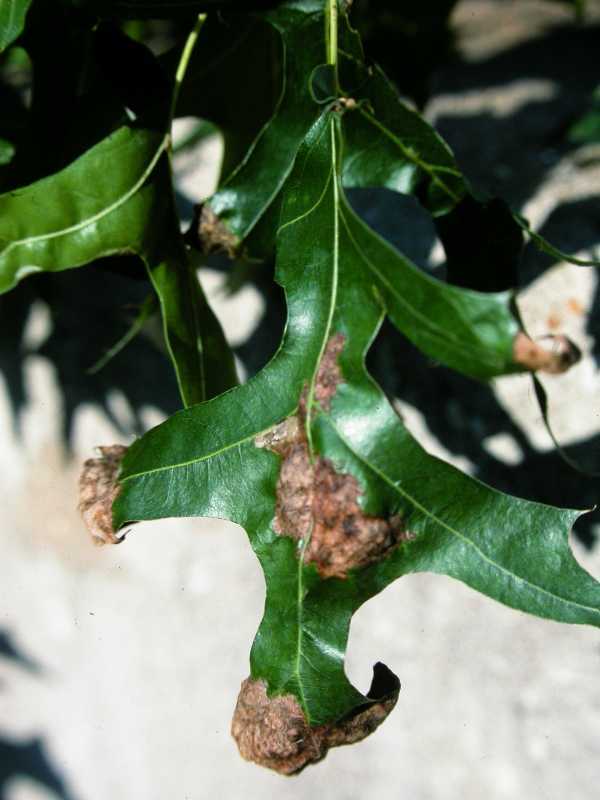 This non-infectious, environmental problem may affect both oak groups, but is especially prevalent on pin oaks. Symptoms are yellowing of leaves especially between the veins, which remain green. It appears on new or terminal leaves and may spread to the rest of the tree. This is due to a lack of iron. Iron may be present in the soil but not in a form available for absorption by the roots. 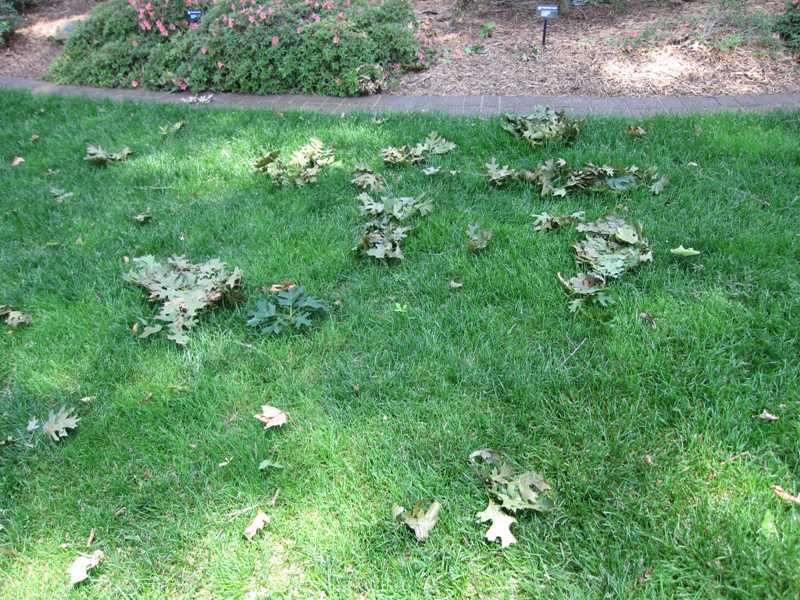 Or the soil pH may be too high (above 6.5) for pin oaks to absorb iron. This is oak flake gall which is caused by a gall wasp. There are many leaf galls on both oak groups, and it is an unusual oak tree that is not infested by at least one kind of leaf gall. Sometimes there are several different leaf galls on one tree. 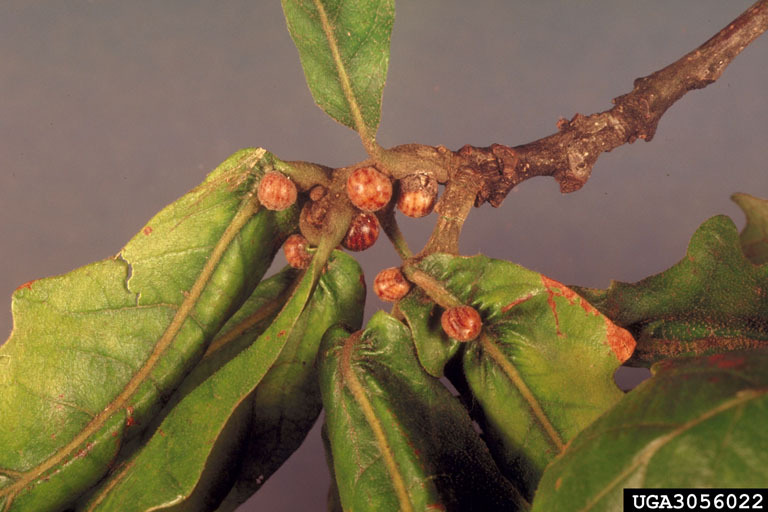 Generally, however, leaf galls are a cosmetic problem only and do not adversely affect the health of the tree. 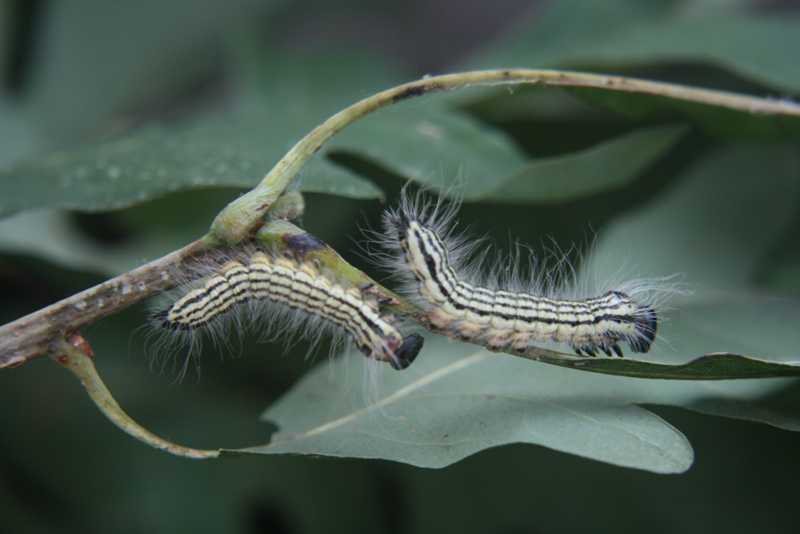 These caterpillars may damage the leaves on both oak groups. They eat the fleshy, green part of the lower surface of oak leaves, giving the leaves a brownish skeletonized appearance. By the time the damage becomes evident, there is no control, but the damage is only cosmetic. Oaks are host to many leaf-eating insects, some more voracious than others, including gypsy moth, tussock moth, fall webworm, forest tent caterpillar, cankerworms, elm spanworm, walnut caterpillar, yellownecked caterpillar, contorted datana (pictured at left) and many other caterpillars and also some beetles, such as, Japanese beetle. Controls may be needed for young trees, depending on the time of year and the extent of the damage, but a mature, healthy tree can tolerate the loss of some foliage without the need for controls. Horned oak galls have small horns that protrude around it. 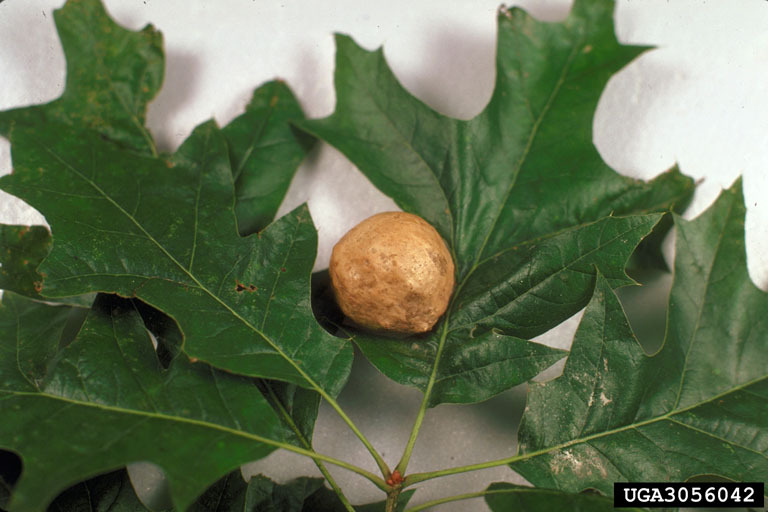 Gouty oak gall is similar except that the galls are smooth and lack horns. Both girdle twigs. They are caused by a very small wasp laying its eggs. As the larvae grow, the gall grows around them, protecting them and providing them with food. 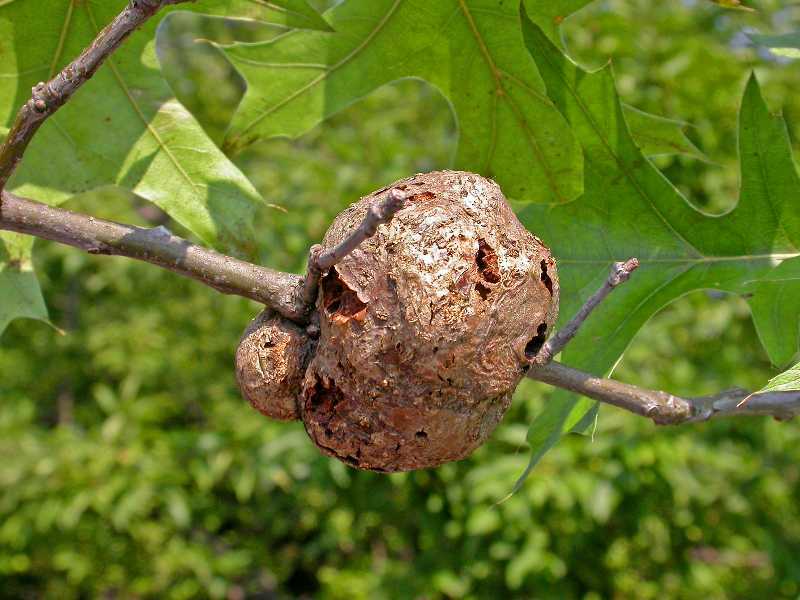 When the larvae of horned oak galls mature, they emerge through the horns. Both types of galls are found mainly on oaks in the red/black oak group. Two years or more are required for the larvae to mature. A heavy infestation may be fatal. There is no way to control either gall. This gall is found anywhere there are oaks. It is usually golf ball sized with a thin papery shell and a spongy interior. It is green when developing and then turns brown. Each apple gall has only a single wasp larva inside. 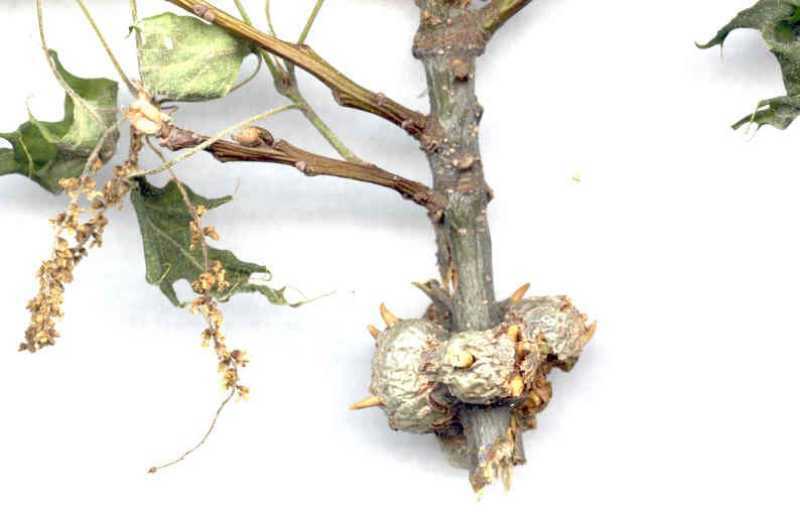 Unlike twig galls, this gall only appears on the leaves and so, like other leaf galls, does not harm the host tree, although heavy infestations may cause early leaf drop. This scale may appear on both oak groups. The females of this insect are gall-like and yellow-brown to black. They occur on twigs, branches, leaves and near buds and petioles. They may cause dieback or "flagging" of branch ends and new leaves. Female cicadas cut slits usually on the underside of twigs and small branches to deposit their eggs. These slits may weaken the twigs and branches causing them to fall especially in high winds. This is a cyclical problem and will not kill the tree. Squirrels cause clumps of leaves to fall on the ground by biting off branch tips while building a nest. Twigs and branch tips may be seen hanging from a branch or scattered on the ground on a daily basis. Young squirrels are trying to build nests without much success. This twig drop was caused by an insect called a twig girdler. The larvae of both twig girdlers and twig pruners bore into a stem and cut off or prune twigs, terminals and branches up to one inch in diameter. 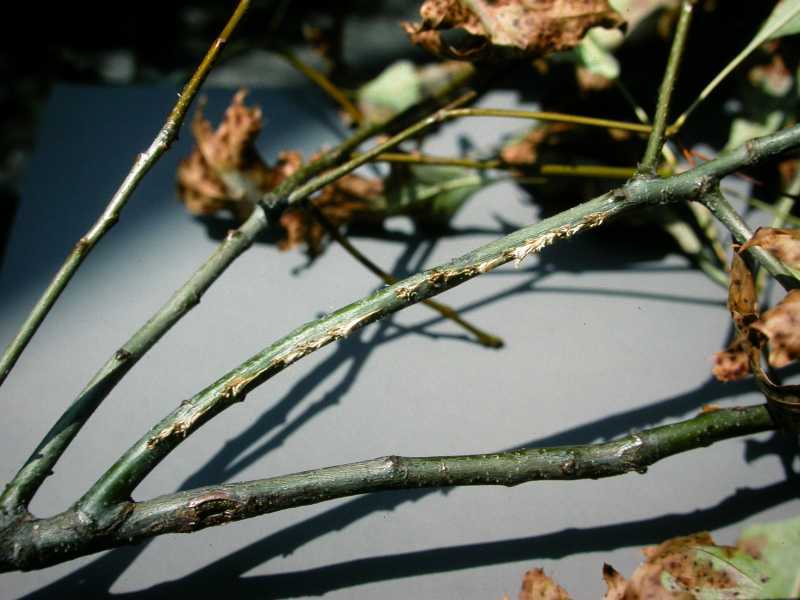 During summer, fall and winter pruned twigs with leaves attached are found. The end of the severed twig appears to be smoothly cut. 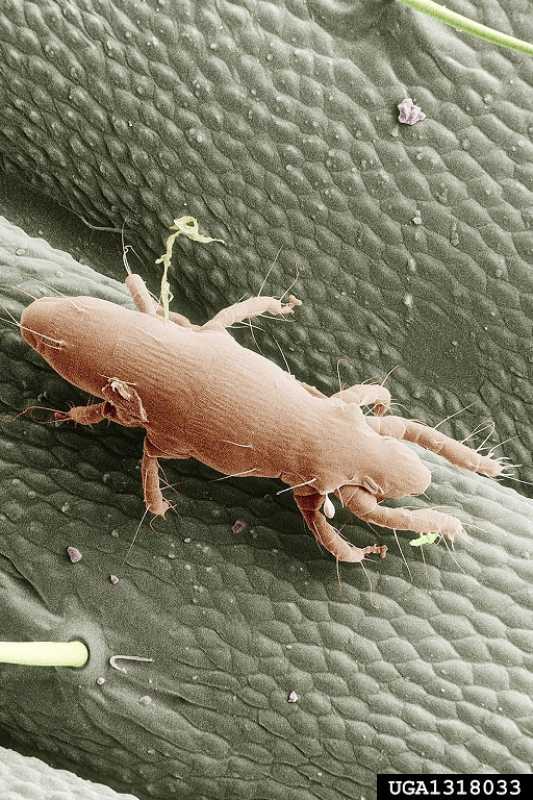 These tiny mites are barely visible. They drop from canopies of infested trees and may be carried by the wind. When they land on humans and bite, the skin appears raised and reddened with small blisters in the center. 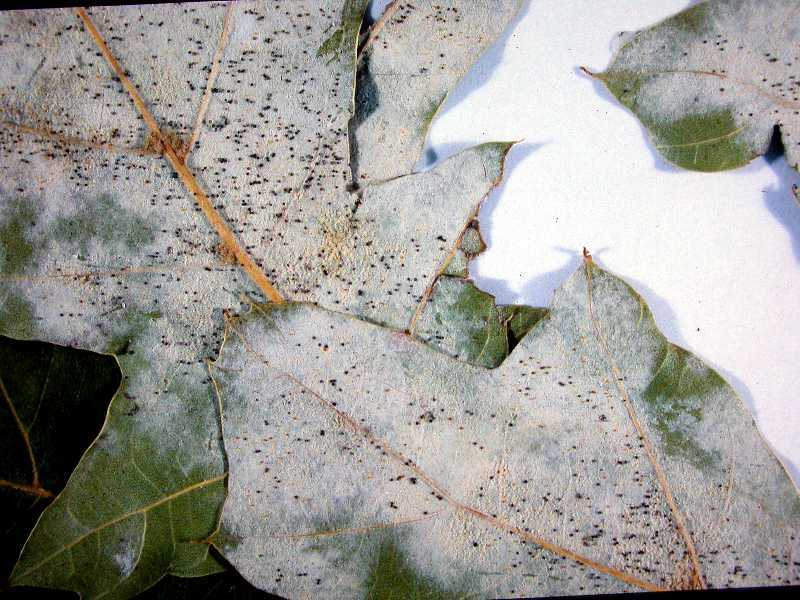 Bites are more prevalent in the fall with increased handling of mite infested leaves. 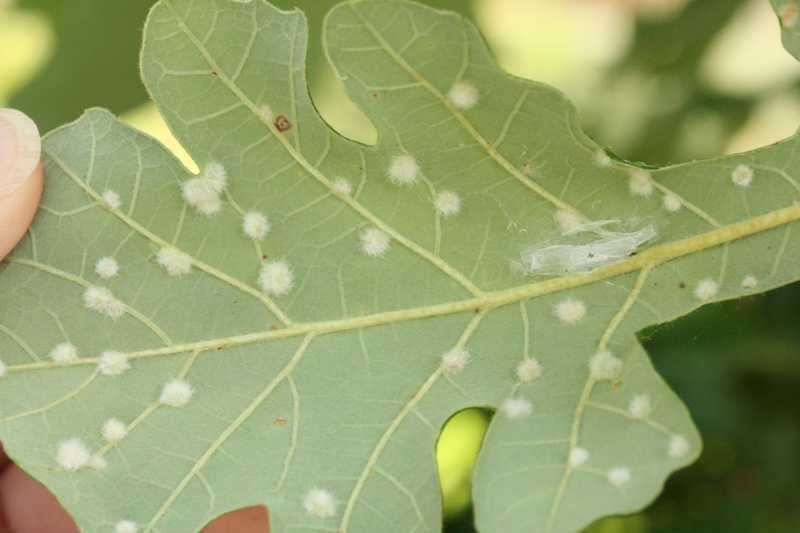 These mites are parasites of a midge which forms a gall on oak leaves. In the Midwest they emerge in late July and persist through summer into fall. Outbreaks are cyclical. There is no known control. As long-lived trees many problems of oaks are man-made: mechanical damage from lawn mowers and weed whips, mulch piled against the bark, digging in the root zone, soil compaction from parking in the root zone or piling up soil around the tree, or tying ropes to the trunk or branches, or setting irrigation systems to water more than once a week, etc.